Il Bambino is a new Astoria import to Greenwich Village that serves up various takes on the panino. For the sandwich averse, there are also salads and other snacks. Il Bambino, 48 W. 8th St., New York, NY 10011, 212-228-2466. The new Natsumi Tapas blends Japanese and Italian cuisines, resulting in dishes such as chicken katsu penne and grilled shiitake with pasta. Natsumi Tapas, 323 Third Ave., New York, NY 10010, 212-889-2182. Marc Forgione has opened a Midtown outpost of his beloved TriBeCa steakhouse American Cut. Located in The Lombardy hotel, American Cut Midtown is similar to the original with a few unique additions to the menu. American Cut Midtown, The Lombardy, 109 E. 56th St., New York, NY 10022, 212-388-5277. Chef Wylie Dufresne (formerly of wd-50) is the culinary advisor for Soho Tiffin Junction, a new fast-casual Indian restaurant. Soho Tiffin Junction, 42 E. Eighth St., New York, NY 10003, 917-514-8409. Studio Kraut is a new Teutonic-fueled Chelsea restaurant serving up meaty dishes like pork shank, burgers, sausages and schnitzel on a nightly basis. Studio Kraut, 160 Eighth Ave., New York, NY 10011, 646-449-8150. Alsatian chef Antoine Westermann has imported his rotisserie chicken restaurant Le Coq Rico to New York City. In addition to chicken, the menu also features duck, Cornish hen and squab. Le Coq Rico, 30 E. 20th St., New York, NY 10003, 212-267-7426. Bill O'Donnell, owner of the perennially lauded Corner Bistro in the West Village, has passed away. Corner Bistro, 331 W. Fourth St., New York, NY 10014, 212-242-9502. 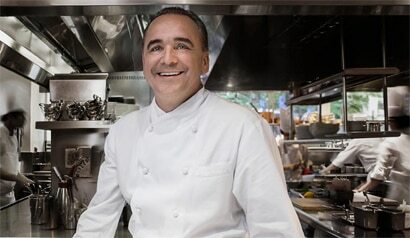 Jean-Georges Vongerichten to Open Restaurant in L.A.
Chef/restaurateur Jean-Georges Vongerichten will open a restaurant at Waldorf Astoria Beverly Hills. The name for the concept has not yet been announced. The opening is scheduled for 2017. Waldorf Astoria Beverly Hills, 9850 Wilshire Blvd., Beverly Hills, CA 90067, no phone. Té Company, the diminutive West Village tea room, has begun a monthly dinner series. Dinner at Bonnie's, named for Bonnie Slotnick, whose cookbook shop had previously existed in this space for years, features a multi-course dinner cooked by talented Frederico Ribeiro. Cost is $95 per person. Upcoming dinners will be on March 11 and April 8. Make a reservation on the official website. Té Company, 163 W. 10th St., New York, NY 10014, 929-335-3168. Alex Lee, who worked as executive chef at Daniel for a decade and then was the top toque at Glen Oaks Country Club on Long Island, has joined Stephen Starr. Lee will be culinary director of the large Starr Restaurants group, overseeing eateries in New York, Philadelphia and beyond. Cercle Rouge, the French bistro in TriBeCa, has closed permanently. Cercle Rouge, 241 W. Broadway, New York, NY 10013, no phone. The Park Avenue outpost of Les Halles --- the location where Anthony Bourdain worked in the kitchen --- has shut down. The John Street branch is still up and running. 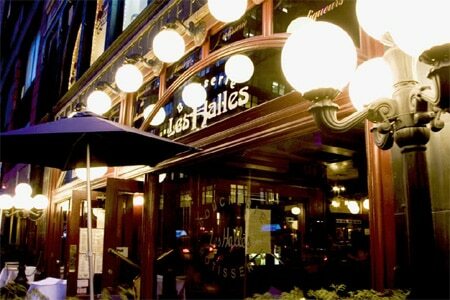 Les Halles, 411 Park Ave. S., New York, NY 10016, no phone. Salt-of-the-earth La Nacional, one of the oldest Spanish restaurants in the country, has sadly shut down. La Nacional, 239 W. 14th St., New York, NY 10011, no phone. Gabe Stulman's hit Italian spot, Perla, has shut down and will relocate to the corner of W. 10th and W. 4th Streets in the West Village. The restaurant, within a meatball's throw of two other Stulman venues (Bar Sardine and Fedora), will reopen in its new home in late March. Perla, 24 Minetta Ln., New York, NY 10012, no phone. Montmartre, the French restaurant in Chelsea, has permanently closed. Montmartre, 158 Eighth Ave., New York, NY 10011, no phone. Now closed in the West Village is Syrian take-out spot Mirage Kitchen. Mirage Kitchen, 100 Seventh Ave. S., New York, NY 10014, no phone. The 17-year-old kid-friendly Greenwich Village spot Peanut Butter & Co. has closed. Peanut Butter & Co., 240 Sullivan St., New York, NY 10012, no phone. Sushi Zen, the longtime and excellent spot for sushi in Midtown, has shut down. The lease is up and they are not renewing it. Sushi Zen, 108 W. 44th St., New York, NY 10036, no phone.